Two of our seniors recently passed major career milestones, which is always exciting! Emily surpassed the 1000 dig mark a week ago down at the Ramapo Invitational, and Becca passed the 1000 career kill mark during our first set against Bates on Friday night. 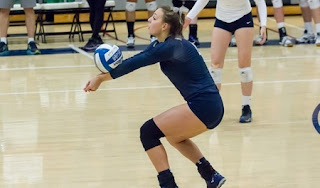 Both are major milestones for a career--Emily's puts her near the top ten in Program History, and she'll definitely finish the season easily in the top 10 for career digs. Becca's weekend puts her in 5th all time for career kills, and she'll climb that list throughout the rest of the season as well. 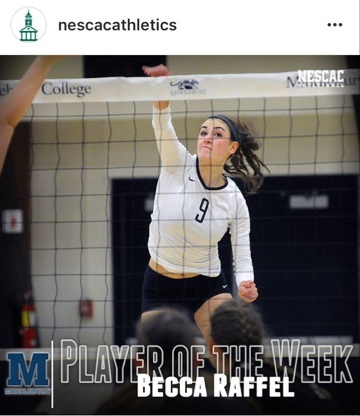 Becca was also named the NESCAC Player of the Week before reaching this milestone based on her performance the week before. Congrats to both of them for these wonderful achievements!